By responding to a simple 18-item inventory, participants will learn their preference for one of four basic behavioral styles, how a preferred style affects behavior, and how to capitalize on strengths/combat weaknesses to create greater success in their lives. What’s My Style is a personality style assessment for management development training. 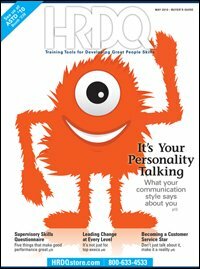 Individuals identify personality style, improve their people skills, learn how personality drives behavior and improve interpersonal interactions. What makes people act the way they do? There’s much debate about what drives human behavior. But one thing is certain – research proves that personality plays a major role in how we act when given complete freedom to do so. Understanding personality style is important because it plays a role in all facets of organizational life, from leadership and teams to communication, selling, and time management. What’s My Style is a quick and accurate training tool for identifying personality styles, and it can be used by all individuals, including employees and managers. Based on the well-known personality theories of Marston and Jung, What’s My Style measures an individual’s preference for one or more four basic behavioral styles: Direct, Spirited, Considerate and Systematic. With this knowledge, individuals can better understand their behavior, the behavior of others, improve people skills, and effectively manage interpersonal relationships. Pinpoint one of four style preferences, Discover how style affects behavior, Recognize the strengths and weaknesses of each style, and Learn how to interact with different styles. The power behind What’s My Style and the HRDQ Style Series products lies in the simple but effective model for understanding human behavior. Based on the proven personality theories of Marston and Jung, the model identifies two basic dimensions of personal style: Assertiveness and Expressiveness. Assertiveness is the effort a person makes to influence or control the thoughts or actions of others. Expressiveness is the effort that a person makes to control his or her emotions and feelings when relating to others. Combining the two dimensions results in a four-quadrant model with four unique personal styles: Direct, Spirited, Considerate, and Systematic. The simplicity of the HRDQ Style Model is easy for trainers to facilitate and memorable for employees and managers to apply. What’s My Style is appropriate for anyone to use for both personal and management development. The assessment can be used as a standalone training assessment, or it can be incorporated into a more comprehensive training program. It makes an effective foundation component for a variety of soft skills training topics, including communication, leadership, team building, and supervisory skills. If you are familiar with the MBTI or DiSC assessments, you will find that What’s My Style is a practical and easy-to-use alternative. What’s My Style starts with an 18-item self assessment that takes approximately 10 minutes to complete. Individuals assign a total of 5 points between pairs of adjectives, dividing the points according to how much they believe each adjective describes their behavior. Scoring the assessment reveals a “My Style Profile” and a dominant preference for one or more four personal styles: Direct, Spirited, Considerate, and Systematic. If you are planning to use What’s My Style in a classroom training session, we recommend you allow approximately 1 hour for interpretation of scores, topic discussion, debrief, and action planning. The What’s My Style Facilitator Guide includes everything you need to lead a successful training session from comprehensive background information and activities, to reproducible handouts and even a professional PowerPoint presentation. The Facilitator Guide also offers an easy-to-follow workshop outline that expands What’s My Style into a 2-hour program. Add an exhilarating and meaningful exercise to any training session. Just My Type is a fun, revealing card game based on Jung’s theory of personality types. By trading and discussing cards and fashioning a hand that best captures their personality style, players learn about 4 personality dimensions: Extraversion/Introversion, Sensing/Intuition, Thinking/Feeling, and Judging/Perceiving. The game gives participants an opportunity to discuss how behavior preferences impact their relationships with others and how they can work together more effectively and productively. This dynamic card game is based upon concepts developed by Carl Jung. His theory suggests that there are 8 personality preferences that we all use at different times. These 8 preferences are organized into 4 pairs of contrasting dimensions. Each dimension represents a particular way we respond to the world around us. For example, where we focus our attention or how we make decisions is determined by our preferences. Our preferences in each of the four pairs combine into what is called a Personality Type. Cards are divided into four “suits,” representing the 4 personality dimensions. Each card contains an adjective relevant to a particular personality style. For example, a Thinking card might contain the word “logical.” Players are randomly dealt several cards from each suit. Some of the cards may describe them, but many won’t. To fashion a hand that best captures their personality style, players trade and discuss cards. After the game, participant workbooks provide an overview of personality types, short activities, and instructions for generating and discussing an optional team profile. Just My Type makes a perfect introduction to any communication, diversity, leadership, or personality-style workshop. The game is also effective as a stand-alone learning event. Each Complete Game trains up to 16 participants. All materials except for the Participant Workbooks are reusable. For larger groups, order one Game Pack for each additional 8 players. While it is quite small in actual size, don't underestimate the power of this nifty pocket guide. The Big Book of Personality Style is jam-packed with key learning points and is a great takeaway to pair with any Style Series title such as What's My Communication Style? or What's My Leadership Style?. People will “walk the talk” when they wear these fun buttons. HRDQ Style Blinkies are a fun and flashy takeaway for anyone who has completed an HRDQ Style Series assessment, such as the best-selling What’s My Communication Style? and What’s My Leadership Style.